Ali Abondo had not featured in the Harambee Stars starting line up since the CHAN qualifier against Ethiopia. His return was an unhappy one as Stars were beaten 3-1 by Zanzibar. He was the only Gor Mahia player fielded in the starting line-up. Coach Bobby Williamson appeared to under-rate the Zanzibaris and fielded a decidedly different squad than the one that played in the opening two games. Just as was the case against Cape Verde, a good start by Harambee Stars was ruined because players were demoralized. This time it was due to unpaid allowances that saw the players threaten not to play. Suleiman Kassim bagged a brace for the Heroes striking in the 45th and 75th minutes of the game while Khamis Mcha Khamis was also on target in the 57th minute to inflict Kenya with a painful defeat. Substitute Jacob Keli pulled Kenya’s late consolation. “We are extremely disappointed. We never looked comfortable today,” Williamson said. More embarrassing for the Stars is the fact that the Zanzibar Heroes had been the whipping boys of the group losing 1-0 to Burundi and 4-0 to Uganda Cranes. Stars build-up to yesterday’s game was overshadowed by demands for allowances and subtle threats not to honour the match. Anthony “Teddy” Akumu was deployed as the sole defensive midfielder in the new-look 4-1-3-2 formation that saw Jesse Were and Allan Wanga partner upfront while Kevin Kimani and Kevin Amwayi operated on the wings allowing Ali Abondo to play centrally behind the strikers. However, Kenya’s tactics failed to work and Williamson summoned Michael Olunga and Eric Johanna respectively fo Were and Amwayi in the second half but there was no way out. It was left to late sub Keli to net the consolation goal. 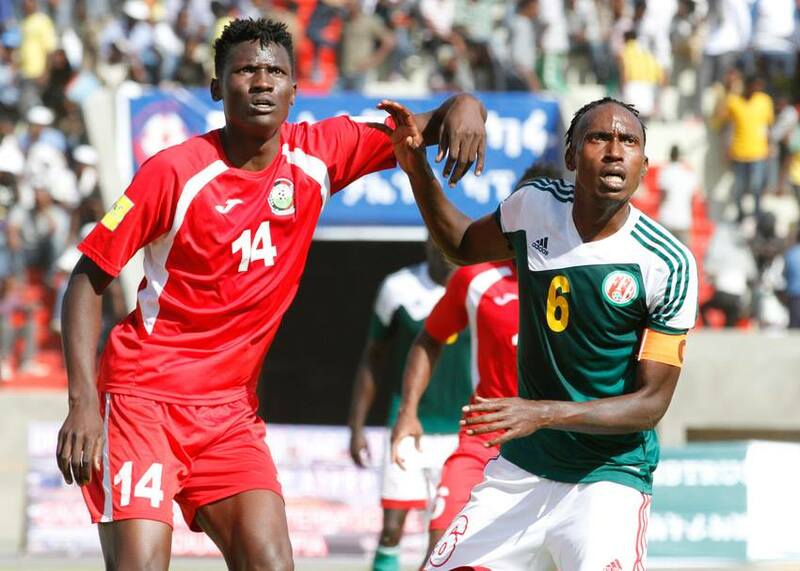 Michael Olunga continued his prolific scoring form for the national team on Wednesday when he scored the equalizing goal as Kenya’s Harambee Stars were held to a 1-1 draw by Burundi. 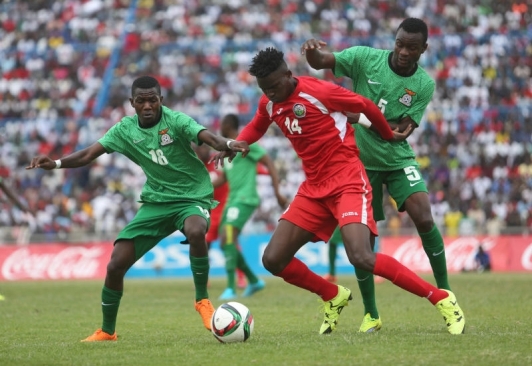 It was Olunga’s 4th goal in 5 games for Harambee Stars, having scored against Zambia, Cape Verde and Uganda. 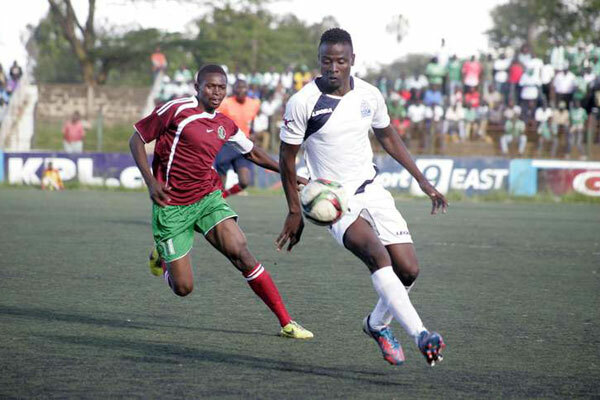 Burundi were featuring Gor Mahia ace full back Karim Nizigiyimana as well as Fuadi Ndayisenga of Sofapaka. Nizigiyimana man-marked club mate Olunga, denying him in the space to operate in the box as soon as proceedings got underway in a packed stadium where home fans were waiting for the Walia Ibex were to take on Somalia in the second game of the day. The Burundians sparked into life when Ndayisenga dribbled past skipper, David Ochieng, on the left to cut in to Tambwe who tapped the ball past keeper Boniface Oluoch to force the champions chase the game. Finland based winger, Clifton Miheso then headed wide from Omar Mbongi’s delivery before seeing his cross intercepted. Stars mounted more pressure on the Burundians and got the equaliser when Miheso delivered a deep ball into the area for Jacob Keli, who scored the opener in Sunday’s 2-0 win over Uganda, who knocked it down for Olunga. 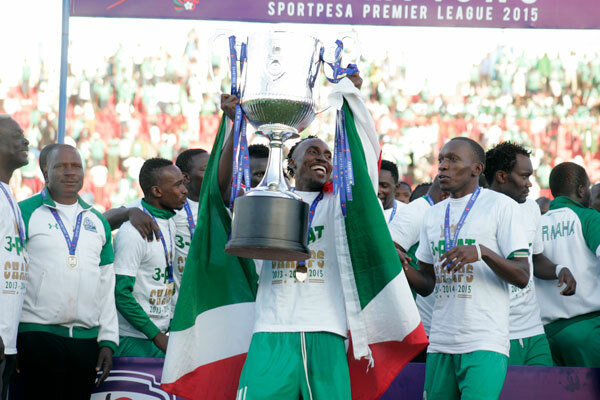 The K’Ogalo forward notched his 37th goal of a memorable year when he brushed past David’s Nshimirimana with a clever dummy before smashing past Arthur Arakaza with a low right foot shot for his second of the tournament. Williamson rang the changes in the second half; introducing Christian Bwamy in midfield for K’Ogalo’s Collins Okoth to seek the advantage. For all his scoring prowess, Olunga and Miheso combined to spurn the opportunities that fell their way with the lanky forward first forcing Arakaza to dive and parry away his long range thunderbolt as Mbongi recovered swiftly on the other hand to block Tabwe’s strike in the box when Burundi attacked the other end. Azam FC forward, Allan Wanga came in for the ineffectual Keli as the Scotsman sought more bite upfront as the half drew to a close. Miheso them cut in for Bwamy who saw his shot blocked but it was Mathare United’s Eric Johanna who could have been the hero when he shinned Didier Kavumbavu to unleash a ferocious low shot but Arakaza but blocked with his legs for a fruitless corner at the near post. Harambee stars put aside their tribulations and put on a spirited performance to beat the Uganda Cranes 2-0 in the opening match of the 2015 CECAFA senior challenge cup. Kenya dominated possession in the first half. It therefore came as no surprise when Zambia based Jacob Keli scored the opener with a well taken finish in the 28th minute following a through pass from Eric Johanna. Keli was menacing throughout the first half and almost doubled the lead in the 43rd minute but his grasscutter was saved by the Ugandan keeper. Coach Bobby Williamson introduced Michael Olunga as a second half substitute. Olunga responded almost immediately with a typical calm and poised finish to double the lead. Olunga’s fine form at club level has also translated to the national teams where he has been prolific, scoring three times in the last four games. Also in action was combative defensive midfielder Collins Okoth who partenered in midfield with former Gor Mahia ace Anthony Akumu. After the match coach Bobby Williamson was upbeat and refused to be drawn into discussing the Cape Verde fiasco. “Cape Verde is gone now. Everyone knows the challenges that we had there but now we are on a different assignment. I have heard the Uganda Cranes coach say that he only played his second string side, but that is up to him really. I brought the best available players and I am very glad that we have won. Winning the first game of any competition is always a good thing,” said Williamson. Uganda Starting XI: Alitho James, Faruk Miya, Denis Okot, Isaac Muleme, Shafik Bakaki , Joseph Ochaya, Ssekisambu Erisa, Muurshid Jjuko, Muzamir Mutyaba, Ceasar Okhuti, Hassan Dazo. An audio recording between president Sam Nyamweya and former Gor Mahia winger and now KEFWA Chairman Innocent Mutiso is currently doing rounds on social media. In the recording , FKF chairman Sam Nyamweya is heard threatening to deregister KEFWA because its officials led by chairman Innocent Mutiso are supporting a rival group ahead of December national soccer elections . A double by Meddie Kagere sinks SoNy Sugar at Kisumu stadium after an epic battle. As is the case each year, Gor Mahia has the most nominations in the annual Footballer of the year awards. Gor Mahia has players in each category: Musa Mohammed, Michael Olunga, defenders Karim Nizigiyimana and Harun Shakava, Meddie Kagere, Khalid Aucho, Collins Okoth as well as goalkeeper Boniface Oluoch are all in the run in for top accolades in the preliminary list that has eight players in every category. The topmost category is the mopst valuable player award that comes with a Ksh 1 million prize. Michael Olunga and Karim Nizigiyimana have been nominated. They will battle it out with Jesse Were (Tusker), David King’atua (Bandari), Bernard Mang’oli (AFC Leopards) and Gambian striker Ebrimma Sanneh (Nairobi City Stars). It is refreshing to note that Nizigiyimana is a defender yet his performance have been noted. Aside from being a solid defender, the Burundian has been a key component of Gor Mahia’s fluid record setting attack. He leads the club in assists and likely leads the league. His inch perfect crosses are reminiscent of the legendary Sammy Onyango “Jogoo”. Michael Olunga may be second in the KPL scorers chart. But he has scored more goals in all competitions than anyone else. This includes superb performances for the national team (U23 and senior team). Previous winners of the award were George Odhiambo “Blackberry” in 2010 and Dan Sserunkuma in 2012. Last season, most observers thought Gor Mahia midfielder Geoffrey Kizito deserved the award but he inexplicably lost to Ekaliani Ndolo of Sofapaka. Coach Frank Nuttall has been nominated for the coach of the year award. This is an award he should win with no difficultly considering that he has taken the club through an entire season without losing. Tactically, Nuttall has been brilliant; Adapting his tactics to the present situation and creating a dynamic offense that scored 60 goals in the league. Zdravko Logarusic was the last Gor Mahia coach to win. That was in 2012. (Western Stima), David Okello (Sokapaka). On Friday, Harambee stars registered an impressive 1-0 win over Cape Verde. It was impressive because Cape Verde are ranked almost 90 places above Kenya in the FIFA rankings and Harambee stars preparations were mediocre even by our own low standards. However a combination of FKF thievery and Ministry of Sports incompetence conspired to throw away the 1-0 advantage. Firstly the players had gone on strike citing non-payment of allowances. Secondly, the government had offered to book a chartered flight to take the team to Praia Cape Verde. However the players were stranded at Wilson Airport for 10 hours. They eventually left only to arrive mere hours before the match. 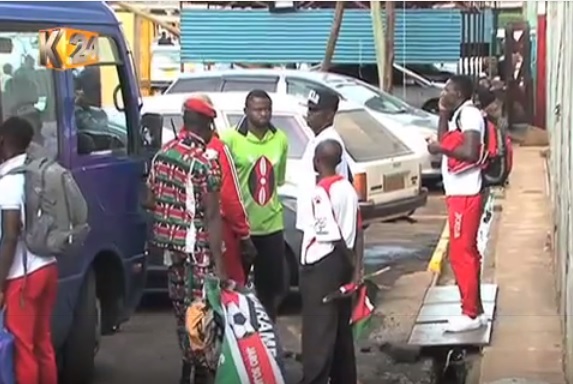 A fatigued Harambee Stars offered only meek resistance. By the first five minutes, it was obvious that Harambee Stars were not going to have any say in this game. This is the second time this year that shambolic travel plans have doomed the national team. Similar problems beset the U23 team against Botswana resulting in an 0-3 loss. Sam Nyamweya was picked up at his Karen residentce by the police for questioning. Reports suggested that Ksh 18 million was availed to him by the Ministry but Nyamweya never saw it fit to use it to facilitate travel. Nairobi CID boss Ireri Kamwende told goal.com that they had questioned Nyamweya on why the team had delayed to leave Nairobi yet the government had released money to facilitate their departure. But Nyamweya defended himself saying the money was released too late. He further blamed the Sports Ministry for the delay in departure pointing out that they took time to release money to enable the federation facilitate their travel. “We only received the money on Monday morning and that is why we were able to pay the players. “I am dissapointed by the ministry because we have been in communication with them regarding this trip but they never made any plans to ensure the team traveled on time.”. Among the Gor Mahia players who traveled to Praia are Boniface Oluoch, Collins Okoth, Michael Olunga who played and Ali Abondo who was on the bench. Given the travails they have suffered, coach Frank Nuttall will be wise to rest them on Friday when Gor Mahia take on Administration Police in the quarter final of the GoTV Shield. Harambee Stars dreams of building on to their 1-0 first leg victory against Cape Verde and advance to the 2018 World Cup group stages were dealt a blow in Tuesday night return leg as Heldon Ramos’ double saw Islanders dispatching Kenya 2-0 to advance by a 2-1 aggregate. The Blue Sharks made their intentions in the home clash known kicking the tie off to a pacy display from flanks with Odair Fortes smashing an effort across the bar in the first minute of play. As if keen to capitalize on Stars shambolic preparations for the clash, their dominance intensified with Boniface Oluoch called to action nine minutes later. The keeper was however brilliant pulling out a full stretch save to deny Djaniny from a one on one from inside the box. Omar Mbongi was to find early proceedings tough after his brilliant debut at home, conceding a 25th minute free kick that the host put into the net. The joy was however short-lived as Ghanaian lines man disallowed the goal with three of their players having encroached from an offside position. Stars sole display in the attacking territory came after the hour mark, Johanna Omollo broke free from the left wing before galloping into the enemies box only to over hit his pass past an advancing Stars payers joining the foray. Last ten minutes of initial half had Cape Verde fancying chances from serried of awarded free kicks outside the box to no avail. Star would however budge late in the half under the myriads of attack. Heldon Ramos’s 42nd minute free kick that took a deflection from the wall before bouncing off keeper Oluoch and past bodies of Stars defenders manning the goal mouth. Skipper Marco Soares plundering powering run from the right flank and cut back to Heldon, saw Cape Verde doubling their lead early in the second half. Bobby responded to the goal with set of offensive changes, Jacob Keli and Jesse Were entering the fray place of Kevin Kimani and Cliffton Miheso. It was Christian Bwamy’s introduction mid into the second half for his debut that seemed to remotely ignite Stars offensive spark. The Norwegian based attacker seeing his strike from edge of the 18 yard box veering just narrowly wide before forcing custodian in to a decent save five minutes later. Looking to consolidate their advantage Rui Aguas opted to for a defensive change late in the game a bringing on Rocha for Fortes as the hosts resorted to maintaining possession to run the clock down as they successfully held out to turn the table on visiting Stars. 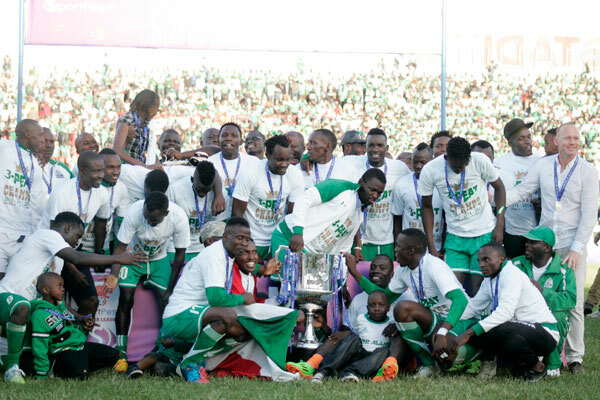 Having won the 2015 Supercup, the 2015 Sportpesa Premier League and the KPL Top 8, Gor Mahia will resume the chase for a perfect domestic season when they take on Administration Police on Friday November 20. The unfancied APs reached the quarter-finals after eliminating Sofapaka whose 2015 season has turned into a nightmare after they started really well and at one point looked like the team that could challenge Gor Mahia. AP won 5-3 on penalties. The winner of the Gor Mahia AP quarter-final will play Nakumatt who also eliminated SoNy Sugar on penalties. 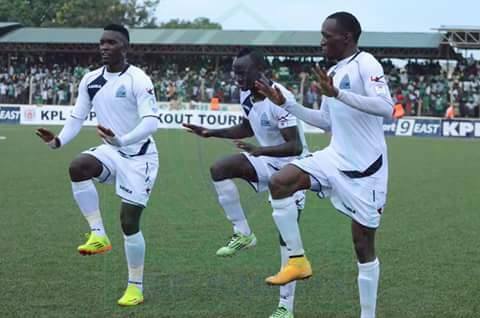 Gor Mahia cannot under-rate the APs considering that they beat Sofapaka. But with coach Frank Nuttall, Kogalo are likely to maintain the focus. The players understand that this is a once in a lifetime chance. Michael Olunga who is having a sensational season is the man Gor Mahia will once again count on for goals. “It has been a good season to me. We won the league unbeaten, had a fine run at the Cecafa Kagame Cup and have already bagged the Top 8 title and looking forward to wrap it up with the GOtv Shield,” said Olunga. Olunga will be in Praia Cape Verde as he leads the Harambee Stars attack against Cape Verde on Tuesday as he continues what has been a superb season at club and national level. “I have made a massive strides this year. Apart from scoring goals locally, I have played at a bigger stage which has boosted my confidence and taken my career to another level. I just hope that this continues even in the upcoming season,” he added. Also in action has this week was the duo of Khalid Aucho and Godfrey Walusimbi who had excellent games as the Uganda Cranes dispatched Togo in Kampala by a score of 3-0. Luckily for Gor Mahia, there is enough time to recover before the match on Friday.